The awards represent an exciting opportunity to acknowledge and thank the efforts of those who represent the future direction of the health and safety community. The Woodward Award for Most Inspiring Individual: Recognition for an individual that has put their heart and soul in to improving safety. The Deeney Award for Most Inspiring Team/Organisation/Safety Culture: Rewarding the group that have created the most imaginative and effective approach to safety excellence. 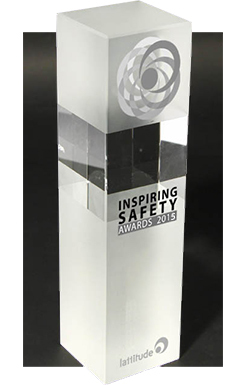 The Lattitude Award for Most Inspiring Campaign/Initiative: Looking at the safety initiative that has inspired and motivated their target action to take action towards world class safety performance. We have also added a special International Award for our overseas applicants making a real difference to safety in the workplace all over the globe.